First and foremost, let me say that it is New Afrikans (Blacks) like yourselves who represent our new Afrikan nation (NAN) with compassion and dedication that is a reflection of the unconditional love and respect that our ancestors demonstrated during their enslavement by our historical enemies (HEs) who unfortunately see us (New Afrikans) as an obsolete people. There are New Afrikans throughout this nation who believe in a new Afrikan ideology that can liberate our people from the malignant American socio-culture, politics and economic system. They have the solutions to our problems. Rather than keeping them in back alleys and prisons, we need to listen and begin to put these theories and concrete solutions into effect. Ask yourselves why it is that so many of the New Afrikans who have a strong political line just happen to be locked up in solitary confinement units. We know they are not terrorists, we know they are not gang members and we know that they are not criminals. So why? Because they are well studied and their political beliefs will undoubtedly liberate every New Afrikan in this nation from mental and physical slavery. Many of these New Afrikans can easily rid themselves of having to endure the suffering by denouncing their political beliefs, but throughout this nation they remain steadfast, refusing to be coerced away from their agenda of dealing with the New Afrikan struggle for liberation. If we cannot be brave enough to associate with these New Afrikans who are willing to sacrifice their lives in the name of our people, then we have a serious problem. I personally believe that the lack of education is our most trying problem. We all should know that our historical enemies are not and will not educate our New Afrikan people. That is the responsibility of our New Afrikan Nation. This is how you rid our communities of the many street vices and pathologies that plague our communities and that have New Afrikan people preying on one another while being labeled terrorists, gang members, druggies, criminals etc. New Afrikan people in this nation can be labeled by our historical enemies (HEs), and our people buy into it without investigating in order to get the facts. Hell, I was once an ignorant, impoverished young man living in the Watts Nickerson Gardens Housing Projects. I couldn’t read or write; I graduated from grade school with seven Fs. Not once did my environment of teachers attempt to educate me. My world became exactly that: my world. But when I got to prison, it was New Afrikan prisoners who come from where I was from – poverty stricken environments throughout California – who civilized me by giving me a proper education of self and of the world. But guess what? These same New Afrikans are the most hated throughout the state of California and many are “keep aways” from the New Afrikan population. This is what made me love what our HEs hate. I’ve come to love the Bay View for your relentless support of the New Afrikan community. And I want to thank you for keeping the hated voice heard. Besides regular visits, add video visits for SHU and Ad-seg so prisoners can visit with approved family and friends who cannot afford to visit them at Pelican Bay. Re-allow the donation of second-hand televisions and radios to indigent SHU inmates when items are placed on their personal property card. Cold-weather-proof the outside walls for those cells that are exposed to outside weather (in this case cells B through E) with a thick rubber membrane so that in winter months, the cells don’t turn into ice boxes. Provide better, non-lumpy, cheaper four-inch thick foam mattresses instead of the lumpy cotton mattresses. Provide for better SHU recreation and book lending programs. There has been a protracted attack against Pelican Bay State Prison SHU prisoners for the last 22 years, where indeterminate SHU prisoners have been sentenced to a civil death by the California Department of Corrections and Rehabilitation. 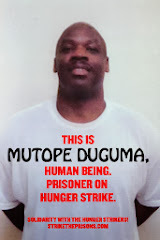 Our civil and human rights have been violated, a policy sanctioned by the judicial system, which allows CDCR PBSP gang officials to hold us in solitary confinement indefinitely on the word of a prison snitch. It is this injustice that has led to the July 1, 2011, hunger strike. We want to bring light to the suffering SHU prisoners serving indeterminate sentences who have suffered for 22 years. Send our brotha some love and light at: James D. Crawford, D-05996, D1-117up, PBSP-SHU, P.O. Box 7500, Crescent City, CA 95532.